The new critically acclaimed historical drama, and Oscar hopeful, from writer/director Jeff Nichols; the man who also brought us 2016's 'MIDNIGHT SPECIAL', 2011's 'TAKE SHELTER' and 2012's 'MUD' (one of my favorite movies of that year). 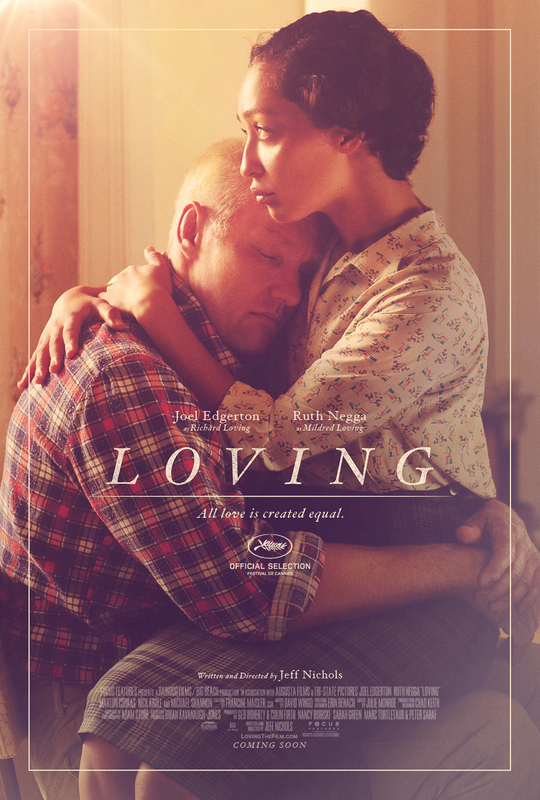 This film tells the true story of Richard and Mildred Loving, a couple that challenged interracial marriage laws in Virginia; a battle which continued all the way to the Supreme Court (in 1967). It stars Joel Edgerton, Ruth Negga, Nick Kroll, Marton Csokas, Jon Bass and Michael Shannon (Shannon appears in all of Nichols' movies, and he and Edgerton also co-starred in this year's 'MIDNIGHT SPECIAL'). The film has received rave reviews from critics, a standing ovation at the Cannes Film Festival, and it will likely receive multiple Academy Award nominations (including Best Picture) next year. I thoroughly enjoyed it. 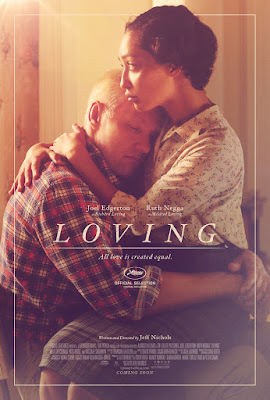 Richard Loving (Edgerton) was a white construction worker, living in Caroline County, Virginia, that fell in love with a family friend, named Mildred (who also happened to be black). When Mildred became pregnant, the two decided to wed. Knowing that interracial marriage was illegal, in the state of Virginia, the two drove all the way to Washington D.C., to get married there instead (in 1958). When the local Sheriff (Csokas) learns of this, he raids the couple's home and has them both arrested. In order to have their prison time suspended, the two are forced to leave the state; and not return there together for at least 25-years. American Civil Liberties lawyer Bernard S. Cohen (Kroll) decides to help them overturn this ruling; seeing it early on as a potential ground breaking Supreme Court case. The movie is beautifully filmed, and acted; Ruth Negga is especially good as Mildred (and she should definitely get an Academy Award nomination for Best Actress). The film tells a very powerful, and extremely moving, true story; about a very important time in U.S. history, dealing with the never ending battle of equal rights for all. What's most impressive about the movie though, is how subtle and seemingly true to life it impressively all appears. The drama is never overdone, or cheesy, and I especially admire how much it doesn't seem like traditional Oscar bait. It's a really well made film!